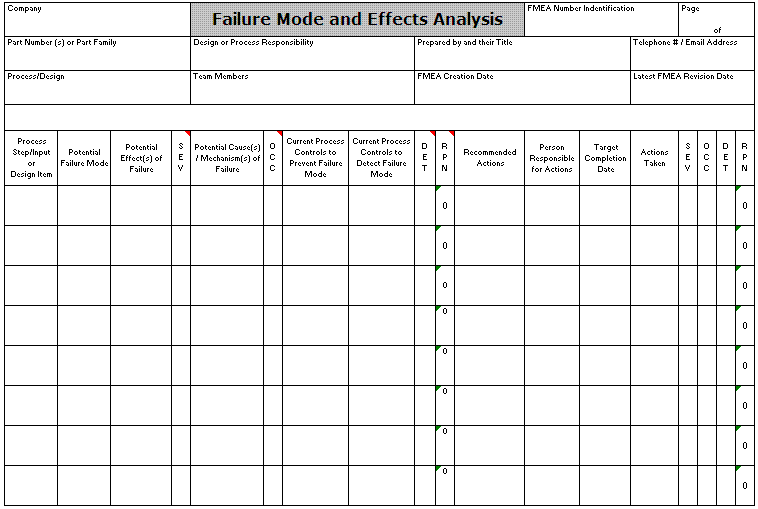 The Failure Mode and Effects Analysis, FMEA, is a subjective screening tool that uses numerical assignments to determine the risk associated with each input. The highest scored items add the highest risk to the problem. Assign a level of risk for each input as in impacts the output by determining the severity, frequency of occurrence, and ability to detect the failure mode for each input. A risk priority number (RPN) is calculated and corrective action emphasis is given to those inputs with highest risk. Any input with a high severity (9-10) should be given attention regardless of RPN. The figure below shows the linkage of the subjective screening tools in a DMAIC project. 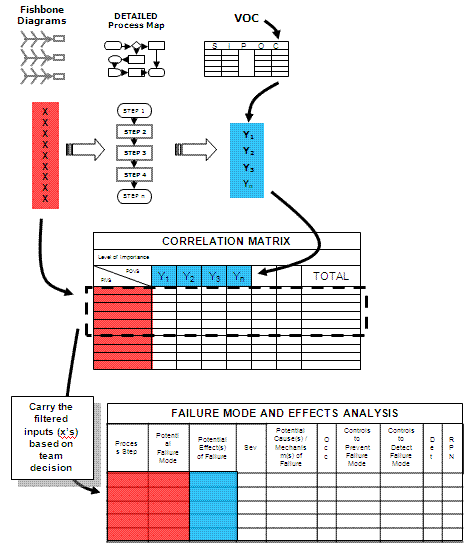 List inputs on left side of table from the Correlation Matrix. List the failure modes of each input. Assign 1-10 for SEVERITY. 1 being not severe and 10 being catastrophic, death, shutdown. Assign 1-10 for the frequency of OCCURRENCE. 1 – extremely rare, 10 being at every opportunity. Assign 1-10 for the capability of DETECTION of the failure mode. 1 being detectable every time, 10 being impossible to detect. Multiply the values for SEVERITY, OCCURRENCE, and DETECTION and the becomes the RPN, risk priority number. Sort the RPN’s from highest to lowest and assign corrective and preventive actions to each. Assign one person to be responsible for each input that the team decides to improve. The team may choose to try all of them or just a few depending on the magnitude, time allotted for the project, and other factors. This activity becomes part of the IMPROVE phase. When the improvements are complete, a REVISED FMEA (see YELLOW portion of figure below) is done by team. The inputs are again scored using the same scales and principles with new RPN calculated. The goal is to reduce the highest RPN’s, complete the easy actions regardless of RPN, and mitigate the most severe inputs regardless of RPN. Assigning ratings is subjective. Companies have different interpretations of each value and its meaning and many have developed tables and guides for each number 1-10 on what they represent. This is an attempt to standardize the development of FMEA's across the company and/or industry to add a higher degree of objectivity to the results. It is more important that the scale applied is linear and well understood by each appraiser to minimize error from interpretation. The appraisers in this application are the team members, each one gets has input. Take time to review the meaning of each value for SEVERITY, OCCURRENCE, and DETECTION. This tool is widely used in the quality control across all industries and segments and will improve customer satisfaction. There are used for design, processes, services, and more. It is recommended to become very familiar with this tool and how it works and its relevance. Click here to purchase the FMEA template that comes with an example. This module provides more detail about the development of a FMEA. This step is valuable to educate the on highest risk inputs and is additional support to drive improvements along with statistical review of the families of variation. All Six Sigma project managers need to be familiar with this tool as it applies to almost every project. 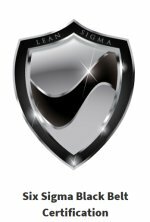 Click here to purchase the FMEA module and view others that are available.